Swept along by the sixties, Tim Van Hook washed up in art school, where he worked in traditional sculpture, film and photography, poetry and art criticism, and conceptual and process art. After art school (Kansas City Art Institute, BFA, 1975), he tried using computers to make art. The crude technology of the time forced him to learn computer programming, which led to building computer graphics hardware, which in turn required starting companies. He worked in computer graphics, visualization, medical and seismic imaging, computer aided design and manufacturing, photorealistic rendering software, hardware, and architecture, for companies such as Computer Video, Ikonas, Adage, Trancept, Sun Microsystems, and Silicon Graphics. After 25 years, four startups, and dozens of patents, publications, and products, Tim is most popularly known for the graphics architecture of the Nintendo videogame consoles: 64, Gamecube, and Wii. 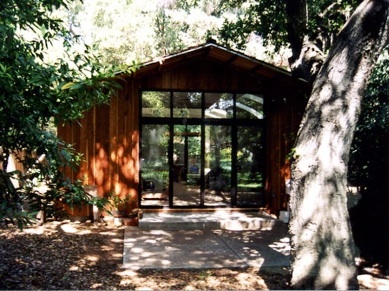 When his last company ArtX was acquired by ATI (since AMD), he retired to the studio he built in his backyard in Atherton, California (pictured). 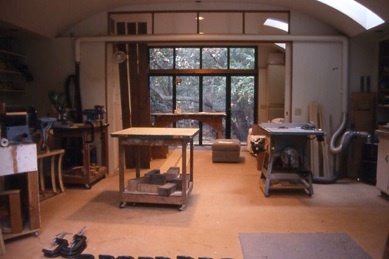 There, instead of leading scores of people in developing computer chips manufactured in the tens of millions, Tim makes singular art furniture, sculpture, poems, songs and movies one by one.